Meridell is home to some of the finest fruits and vegetables in the whole of Neopia. Until the Slorgs arrive, that is. Because when the icky, nasty Slorgs decide they are hungry, there is not a farmer in the land who can stop them. 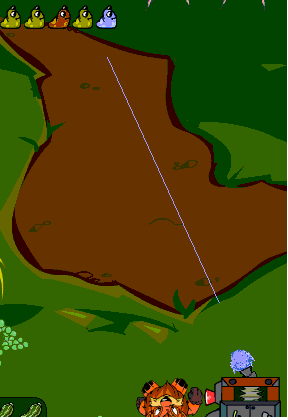 The point of the game is to prevent the Slorgs from getting to the Yurble Farmer's crop. In order to do so, you manoeuver the Slorgeriser X4 left and right, shooting Slorg-B-Gone at a line of Slorgs that continually grows until you complete the level. Note: You do not have to shoot every Slorg-B-Gone ball at the Slorgs. If you do not want to use one ball, just shoot it off the screen away from the line of Slorgs. Yeah, watch where you aim that thing! Slorg Block: Creates a block that prevents Slorgs from moving. However, you cannot keep them stopped forever; if you wait too long, the game will say "Delay of game ;)" and will create additional Slorgs as a penalty. Multislorg: Creates additional Slorgs to destroy. Slowdown: Slows down the line of Slorgs only during the possession of this ball. Super Slorgerizer: Destroys two Slorgs on each side of where it is shot. 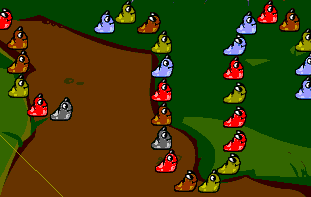 Puddle Water: Changes all the Slorgs to the same color. Slorg Destruct: Destroys all the Slorgs behind where it is shot. Break up that line of Slorgs with some Slorg Block! Laser Failure: The laser guide for shooting the Slorg-B-Gone starts flashing and will soon be gone for the rest of the level. However, you can easily counter this by typing "chargex4". The best part is, you can use this cheat as many times as you want! You better get used to it real quick or else I'm Slorg chow! Type in "marrow" without quotes for an extra life. If you cause a chain reaction of destroying Slorgs, you get however many sets of Slorgs you destroyed times the bonus. For example, if two brown Slorgs are sandwiched between two pairs of green Slorgs, clearing the brown Slorgs will cause the two pairs of green Slorgs to come into contact and be cleared too. For this you would get a 2x bonus. If you clear all the Slorgs for whatever reason, you get a clear bonus. When you lose the laser guide, do not just randomly shoot the Slorg-B-Gone. Aim as best as you can; it was only a guide, after all, and with a little practice, you should survive without it. But if you really want your laser to come back, type in "chargex4" without quotes. Unlimited use. There are only 6 unique paths that the Slorgs follow; once you get used to them, they are easy to handle. Try to avoid using the Multislorg, unless you are sure you can handle more Slorgs that is. Hit the Quiggle that pops up during the game and get a 25-point bonus! Is there a Quiggle Protection League?